The thermometer is still pushing triple digits most afternoons in Salt Lake City, but the fall racing season is approaching quickly and before you know it the 18 hours of daylight will be long gone. Lately we've been going back and forth on fall marathon plans, and I think we've got it figured out... I'm planning to run 2 marathons this fall - Top of Utah (September 15th) and the California International Marathon (December 2nd). Andrea is using the end of the summer to try and finally completely fix some of her nagging injuries, with hopes of being able to put in an uninterrupted training cycle this fall and run CIM in December. Along the way, we'll run a handful of local races (including what is left of the USATF-Utah circuit), and will probably also take a trip down to Arizona in early November for another shot at a fast half-marathon. This summer has been one of unstructured training, yet I've put down a huge aerobic base. I've backed off the track work and tempo runs, and just focused on running as much as I feel like, having lots of fun, and run commuting (I've driven my car to work a total two times so far in July and August). We've taken some awesome trips (Exhibit A - Exhibit B) and it was mentally and physically refreshing to get out on some cool trails and run in new places. I've been averaging over 140 miles per week for the past 7 weeks, with a high week of 160 miles (don't ask my how that happened - I need some other hobbies!). Only very recently I've started incorporating some faster tempo efforts back into the training. My plan is to run TOU mainly off base training - be at a super high aerobic level, and then just sharpen up by racing 4-5 times in the next month. In two weeks I'll head up to Logan for a preview of the marathon, as I'll be racing the TOU 1/2 for the second year in a row. Last year I finished in 2nd place (1:05:40), while Andrea won the race by a wide margin. 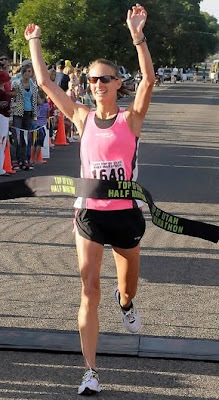 You can check out our 2011 TOU Half Marathon Race Recaps. This summer I haven't been running workouts at the intensity level usually needed to run a sub 1:06 half, so I have no idea what to expect. I plan to just go run off "feel" and see how quick I can go - if nothing else, this will be the best indicator of what time I should be targeting in the marathon. After TOU, I'll take a little down time, then put in what will hopefully be a big training cycle for CIM. That race is one of the fastest, most competitive marathons in the USA. As you might expect, I really want to get under that 2:20 barrier this year! Awesome plans. You guys are going to be busy this fall. Come down to Payson on Labor day and run the Onion days 10k/5k. It is $15 and completely flat. And you might even get a bag of onions if you win. :) You guys can stay with me again if you decide to come. We could even plan an epic frb Nebo hike. There's a very good chance I'll run the Onion 10K. That would be a perfect last "big" workout before TOU. Usually I like to do something about 10 days out - that would be 11... close enough! Or we could break the world record with the Nebo 1 miler!